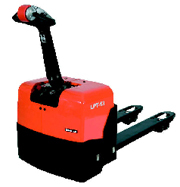 Easily manoeuvred and safe motorised pallet truck. Multifunction handle with safety switch that ensures the operator is not crushed between walls and trucks when reversing. The motor control is manufactured by CURTIS. Easy and light steering for safe use. 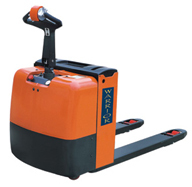 The WARRIOR Heavy Duty Powered Pallet Truck is a rugged 2000Kg unit which will easily cope with the arduous conditions found in busy factories and warehouses. The compact design combined with the new technology makes the WARRIOR ideal for narrow, cramped aisles. The shortest head length in the market permits superb manoeuvrability. Smooth Curtis controls combined with a powerful electromagnetic dive unit make light work of everything. Supplied c/w 210AH Traction Battery & 24V/30A Free Standing Charger.